When you register with the National Library of Scotland you have free access to an extensive range of electronic resources. If your main address is in Scotland you can also use many of these resources from any computer outwith the National Library simply by logging into your Library account. Among these resources are two that are essential for anyone interested in any aspect of the early modern period. 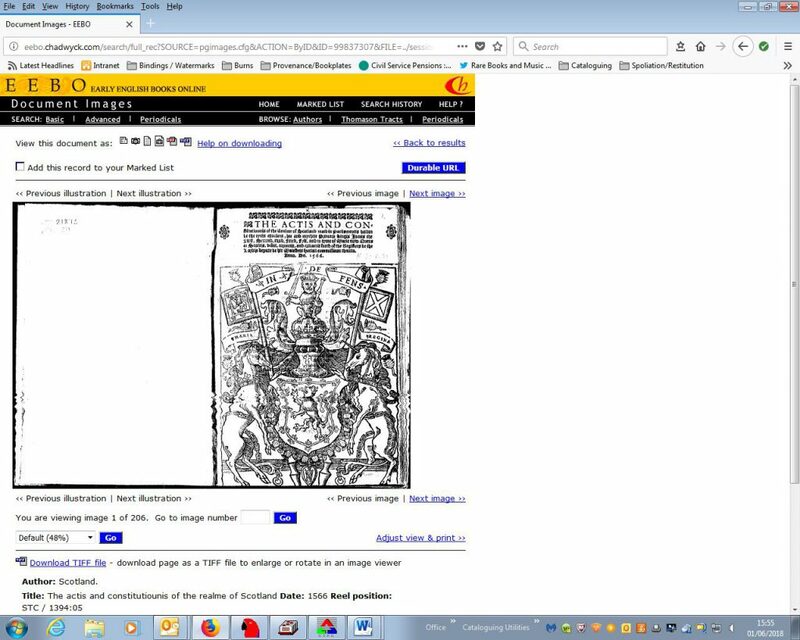 Early English Books Online and Eighteenth Century Collections Online – commonly referred to as EEBO and ECCO – provide access to page images of works printed in the British Isles and British North America from 1473 to 1800, as well as works printed in English elsewhere. These resources grew out of earlier efforts to systematically record and microfilm all relevant material held in Libraries across Britain and North America. To create EEBO and ECCO existing microfilm series were digitally scanned and latest figures indicate approximately 132,000 titles in EEBO and 135,000 in ECCO, equating to over 17 million and 32 million scanned pages respectively. Both resources can be searched in the same way as the Library’s catalogue: by author, title, year of publication, keywords and so on, limits can be applied to refine searches and author lists can be browsed. Within ECCO users are also given the option to search for books with illustrations, to search specifically within front matter, main text or the back of the book and to carry out fuzzy searching. 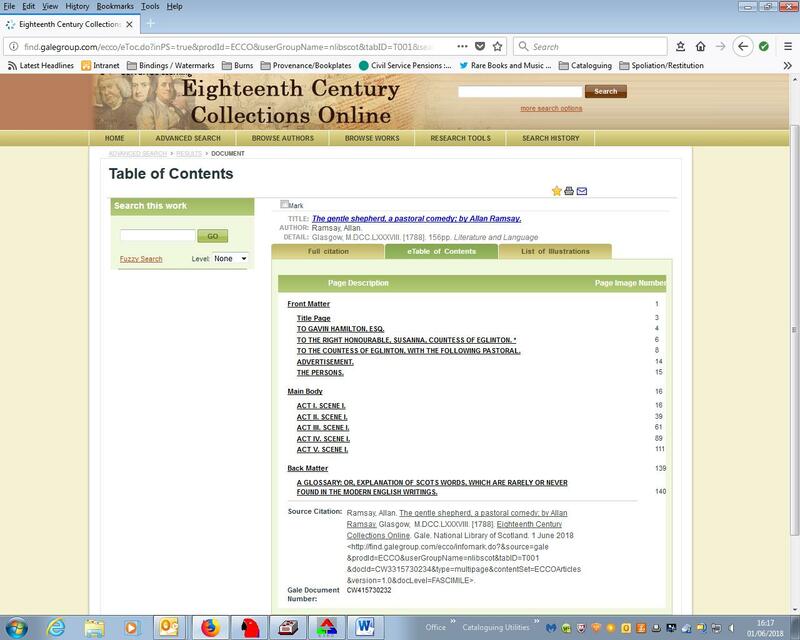 Records in the Library’s catalogue now contain direct links to EEBO, and entries in the English Short Title Catalogue or ESTC contain links to both EEBO and ECCO. One of the most useful features of both resources is that full-text searching is available for approximately 50% of the works on EEBO and all of those on ECCO. Users can also cross-search between both databases. The full-text searching in EEBO was made possible by the Text Creation Partnership a not-for-profit organisation based in the library of the University of Michigan. As well as being of use to scholars in locating primary texts, EEBO and ECCO are of great use to librarians in their work. They allow us to compare our library’s copy with the one digitised and to verify whether a book is perhaps lacking leaves or is in some previously unrecorded state in which, due to the vagaries of hand-press book production, the type has been set in some subtly different way. A little patience and comparison with books found on EEBO and ECCO can also reveal the identity of fragments of works for which the title leaf or other preliminary or end material is missing: the full-text searching being particularly helpful for this. As the digitisation for EEBO and ECCO was done from microfilms rather than the original texts, and some of the microfilms were created decades ago, the quality of some images is less than one would like but overall texts are easily legible. For those seeking copy-specific information there is of course no substitute for consulting the original but if is just the text that is needed then there is no doubting the facility of being able to consult many texts quickly which could otherwise involve research trips covering thousands of miles. Plus, if all that is needed is a quick check of a reference, then using EEBO and ECCO can saving having to bring a book from the stackfloor to the Special Collections Reading Room thereby saving avoidable wear and tear.